Why You Should Check It Out: If traditional reformer Pilates isn’t enough of a cardio challenge for you, Pilates Platinum might be just the studio you’re looking for. The fast-paced signature Platinum Pilates class - taught on Megaformers and Proformers - is Pilates at its core, but keeps the heart rate up with a cardio component, builds muscle quickly with increased strength training. For even more cardio, Pilates Platinum offers indoor cycling, both on its own (Platinum Cycle and Platinum Cycle with Weights), and as a complement to Pilates (Platinum 30/30). Enhancing the workouts are motivational instructors, who push students to work hard throughout the class, while correcting form to ensure a safe, effective workout. What Makes It Such An Effective Workout? Pilates Platinum offers all of the benefits of Pilates - lean muscles, core toning, increased flexibility - in addition to the fat burning power of a cardio workout. Instructors encourage you to push past muscle fatigue to gain the full benefit of the 55-minute class. On the Playlist: Get your sweat on to a mix of artists, including Red Hot Chili Peppers, Zedd, Katy Perry, Lorde and Pharrell Williams. Know Before You Go: Sign up in advance, as class space is limited…and popular! New students should arrive 15 minutes in advance of the first class for a rundown of the apparatus. Parking varies per studio. The Brentwood and Venice Beach locations provide parking validation that grants students a discounted rate. The Santa Monica Studio recommends parking in the adjacent lot on Arizona Ave, which has free parking for 2 hours. If you are not lucky enough to snag a parking space behind the Hollywood studio, street parking is the best option (plan a little extra time to find Hollywood street parking!). Come Prepared With: Wear clothing that conducive to stretching and sweating. 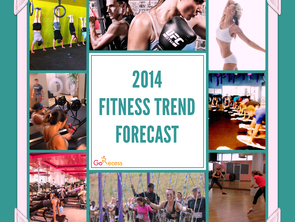 Avoid loose fitting pants for the classes that include cycling. Toesox, or socks with grips, are mandatory for all Pilates classes, and are available for purchase at all studios. Prepare to sweat with both a workout towel and a water bottle. Pilates Platinum began shortly after Heather Dorak had experienced her first workout on a Megaformer, which is the revolutionary version of the Pilates machine, the Reformer. Like many of her current clients, she fell in love with the workout and experienced amazing results after just a short time. Her passion for health and fitness inspired her to open her first studio in Hollywood in 2006 with a small goal in mind to introduce this amazing workout to the community. The phenomenon caught on very quickly, so much that she decided to expand her business and has since opened studios in Brentwood, Venice Beach and most recently Santa Monica. 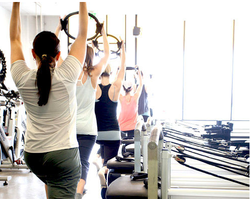 Pilates Platinum is dedicated to creating a fun and energizing workout that is a journey for the mind, body and core. 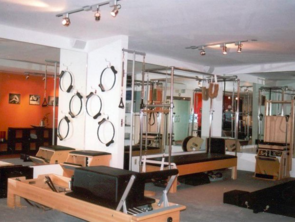 Pilates Platinum believes great customer service, a beautiful clean studio, state of the art equipment and amazing trainers are key to creating the best fitness experience for clients.